Corporate America is still seriously short on women in senior level and top executive roles. And it might not get better anytime soon. A new study from McKinsey & Company and LeanIn.Org estimates that at the rate we're going it could take about 25 years to reach gender parity in senior vice president roles, and more than 100 years to do so in C-suite jobs. A common assumption is that there are fewer women in power because women are more likely than men to quit when work-life balance gets out of whack. 1. 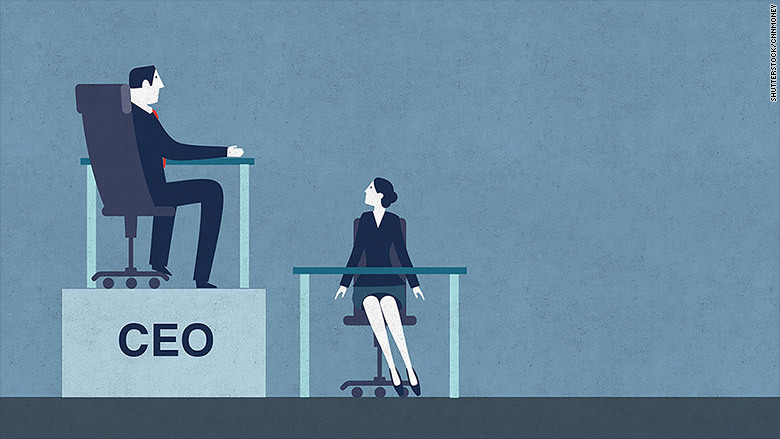 Fewer women tend to be in roles that lead to the C-suite. Women are more likely to occupy staff roles, which don't produce revenue. Think administration, HR, legal and IT. By contrast, men disproportionately fill positions that are core to major operations and the bottom line -- the pipeline jobs that leads to the C-suite. 2. Women express less eagerness than men to ascend to a top executive spot. 3. Women's professional networks tend to be all-female or mixed gender. Men tend to network just with other men. "Given that men are more likely to hold leadership positions, women may end up with less access to senior-level sponsorship," the report noted. When it comes to perceptions of gender discrimination, there's a wide gap. Women are four times more likely than men to think they have fewer opportunities to advance because of their gender. And they're more likely to say they missed out on an assignment, promotion or raise for the same reason. They also report being consulted less on important decisions. By contrast, 70% of men say gender diversity is important, but only 12% think women have fewer opportunities than they do. And among all respondents, only a third think gender diversity is a top priority for their direct manager. The study doesn't assert a causal link between the views held by respondents and the underrepresentation of women at the top. But it does provide "signals" to companies concerned about gender diversity, the report's authors told CNNMoney. For instance, a company may say gender diversity is important, but it needs to do more to foster it. That means tracking key metrics over time -- such as promotion rates and attrition rates. It might mean beefing up professional development programs that better direct women to senior roles. And it might mean getting a better beat on employee perceptions, such as where women feel barriers to advancement or why they are drawn to staff roles.